Former Shahrizoda member Aziza is married! When doing some research on the girls a while back, I inadvertently discovered that former Shahrizoda member Aziza was married! 23-aprel kuni aktyor Ulug‘bek Qodirov “Venetsiya” restoranida 6 yildan buyon ko‘ngil qo‘ygan sevgilisi “Shahrizoda” guruhi sobiq xonandasi Azizaxonga uylandi. 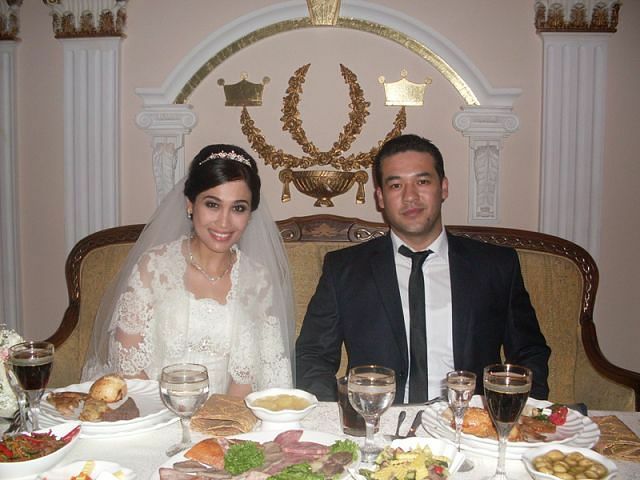 Rough English translation: On the 23rd of April (2013) at “Venice” restaurant, actor Ulug’bek Qodirov married his sweetheart, Aziza, former member of the group Shahrizoda. This got me really excited. I then did some more digging and found a couple of photos of the pair. It was definitely one of our original Shahrizoda members, just all grown up! Not only did we now have her real name (no last name as yet), but her husband starred in the film Panoh with other former member Muborak! There is even a video of the wedding. For some reason, a lot of Uzbek weddings of famous actors or actresses are filmed and then put on YouTube. Most of the time, it’s just showing people dancing. Singer Shohruhxon is a special guest (and lip-syncing, as Uzbek performers often do!). At 10 minutes and 40 seconds into the video you can spot Shahnoza dancing, and another girl who has been known to perform as part of the group (see: video for ‘Amira’). I believe this is Ulug’bek’s second marriage, his first being in 2012 which ended months later. Enjoy! We wish them every happiness, tabriklaymiz!